With just three days left till Summer in Southside, our Hippodrome Ambassadors Heather and Sipho caught up with some of the artists set to perform at the festival to find out more about their work. They chatted to singer-songwriter Alisha Kadir, one of four acoustic acts opening Saturday night’s MIX UP event in the Stageside Bar opposite the theatre. Alisha will lead the line-up from 8pm, followed by Birmingham-based performers Transits, Ed Geater and Elektric. “I like writing about the balance of power and how power works,” she said. Nevertheless, she doesn’t see herself as having been heavily influenced by other political artists. 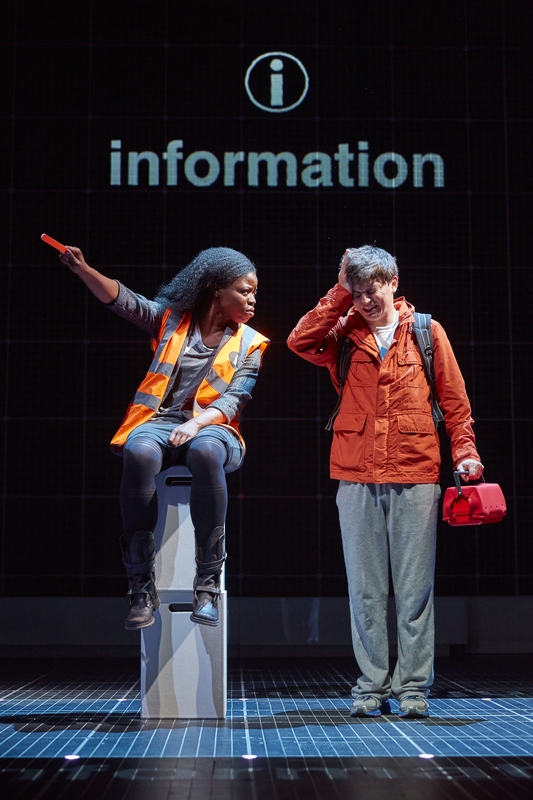 Deeply unsettling and deeply funny, The Curious Incident of the Dog in the Night Time is an emotional whirlwind of a play that opens its audiences eyes to the world it inhabits by channelling it through someone who sees things differently. It alerts us to the things we take for granted, the things that we ignore, and the things that we often, rather foolishly, obsess over. 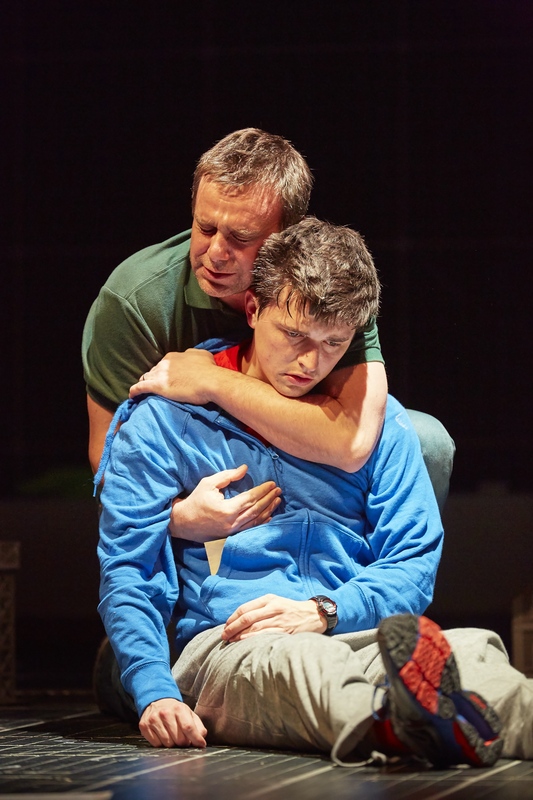 Joshua Jenkins has real star quality as the remarkably resilient Christopher, both a comfort and a distress to his emotionally fragile father, played with painful and touching integrity by Stuart Laing. Elsewhere, Clare Perkins is hilarious as the grumpy head of Christopher’s special school, while Geraldine Alexander is likeable and engaging as his teacher-come-narrator, Siobhan. Siobhan is reliable, open and honest, a port in the storm of Christopher’s life. She seems to understand him more than most, perhaps mainly because she listens and tries. 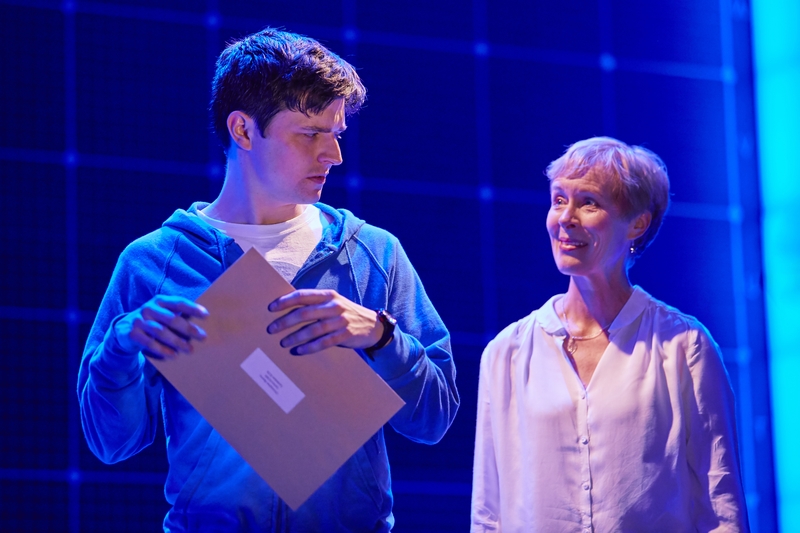 She is the one person who permits Christopher to tell his own story in a world where everyone else typically controls the plot and decides how best to direct him – although she is wrong about the maths problem. Mark Haddon writes in the programme that he regrets that the term “Asperger Syndrome” appeared on the original book cover. In a world where diagnoses are all too often seen as catch-all explanations, such terms can limit and close-down our understanding as much as they expand it, and it is becoming more important than ever that we recapture a sense of people’s individuality. The play does not name Christopher’s condition, and its greatest achievement is to put its audience inside Christopher’s head through clever staging, lighting and structure, as much as through any feat of acting. Masterfully directed, it allows us to feel the world with him: overwhelmed by the glaring sensory overload of London; in awe of the intricate wonders of the universe and how small they make our human problems seem; angry at the deceit of his loved ones; and instinctively enamoured of the tiny puppy he eventually receives from his father. Most of all, we enjoy the hunt: we want Christopher to succeed and find his answers. We might spot the solution before he does, but in what detective story is that not true? Half the fun of Sherlock Holmes or similar fiction is the gratification derived from discovering the answer before the supposedly ingenious detective gets it. Of course, it is always easier to understand a problem that is not your own. In Christopher’s situation, caught up in a web of lies, confusion and complex sexual and emotional politics, how many of us would have been able to see the wood for the trees? Or even allowed ourselves to? This is, after all, as much a story about self-deception as it is about deceiving others: Christopher’s mother convinces herself that her family would be better off without her, his father that Christopher is better off not knowing what has happened to her. These are only falsehoods in the same sense that Christopher understands plays and metaphors as lies: just because they are not facts, doesn’t mean that they are not, in some sense, true. In the programme, Haddon suggests that Curious might really be more about us than it is about Christopher. Here’s another contention: Curious, like many (arguably all) good stories is more about storytelling than anything. How do people write the world? What do they see? What do they miss? How do we narrate our lives? Curious allows us to understand the nuanced and varied perspectives of all its different characters, despite the fact that it is this very nuance and difference that Christopher struggles most with. The stories his mother and father and all the other people around him tell serve the same function for them as mathematical equations do for Christopher: they are a reassurance, a means of imposing a kind of order and logic on a bewilderingly chaotic universe. Changes to these stories frighten them, as much as change unnerves Christopher, which is precisely why his father feels the need to suppress narratives written by Christopher and his mother that conflict with his own. 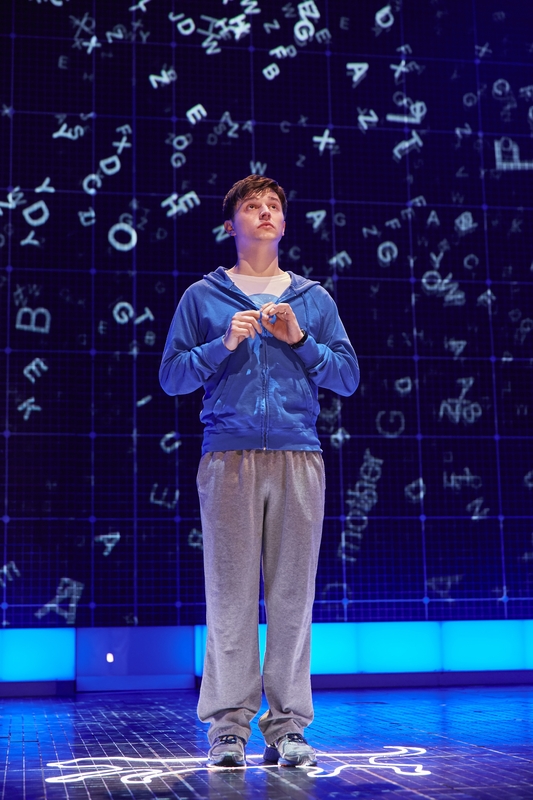 The structure of Curious on stage reflects this, with Siobhan acting as the placid voice of reason as she reads from Christopher’s book and offers him encouragement. As a result, the ending – or rather, the lack of one – becomes even more poignant. Christopher’s story is left incomplete. He closes the play celebrating his successes so far and believing that they mean that he can now do anything. To his mind, the narrative of his future life is already written, and all that remains is to turn the pages and read it. His teacher, on the other hand, doesn’t seem so sure. Whatever kind of calm Christopher has found for the time being, in five, ten, twenty years, like any of us, he will be a different person, in a different story. 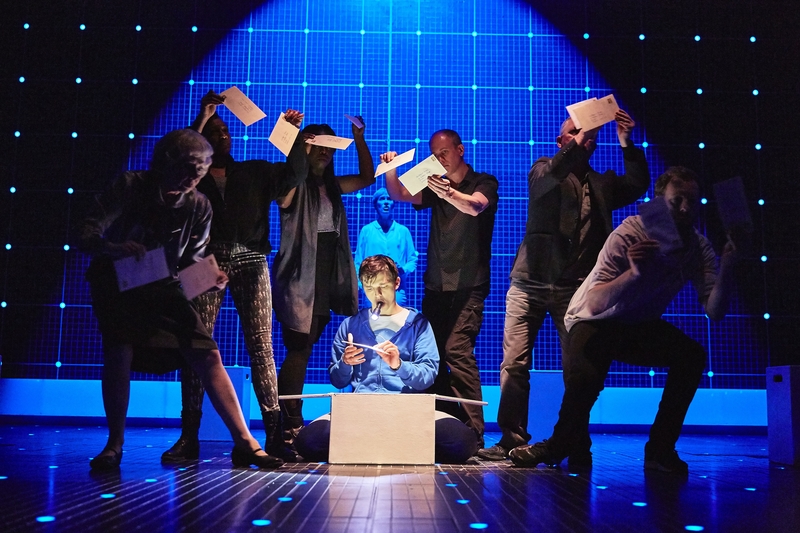 The Curious Incident of the Dog in the Night-Time is showing at the Birmingham Hippodrome until Saturday 6th June. To book tickets, visit the Birmingham Hippodrome website or call the box office on 0844 338 5000. 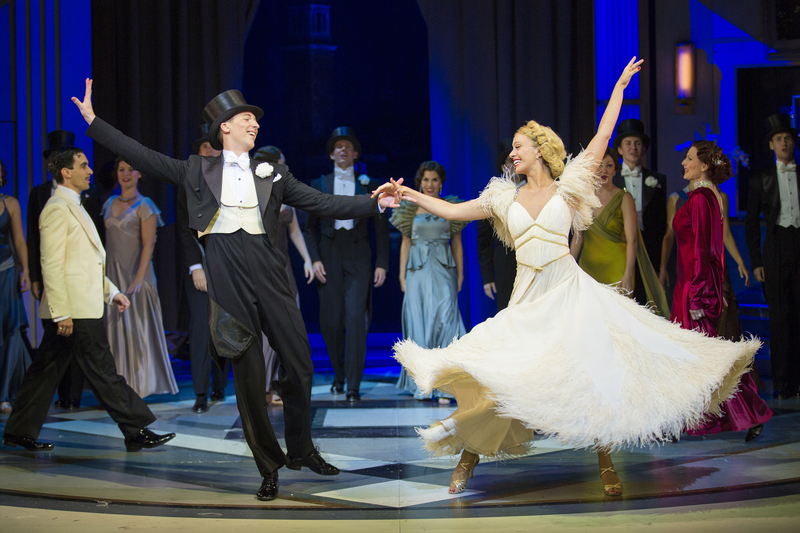 Last night theatre-goers flocked to the Birmingham Hippodrome in posh frocks and dinner suits, “spending every dime for a wonderful time” at the special “Top Hats and Tiaras” themed opening of Top Hat. 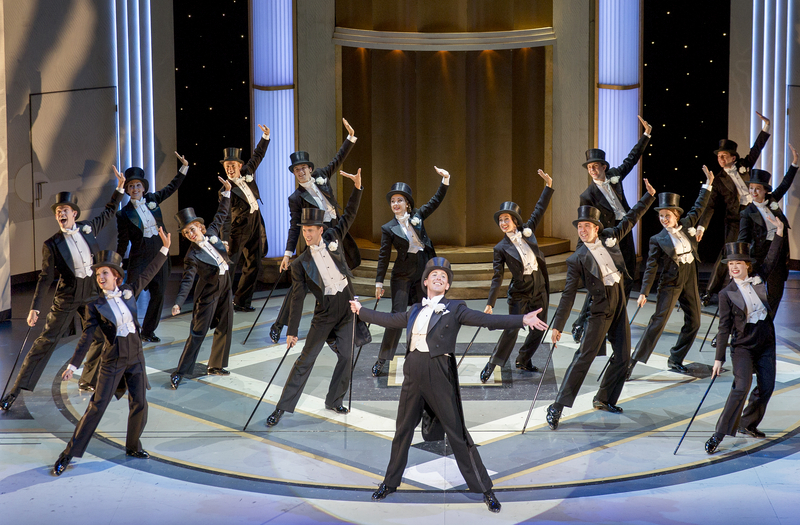 Based on the classic 1935 RKO movie with Fred Astaire and Ginger Rogers, Top Hat is an Olivier Award-winning musical adapted by Matthew White and Howard Jacques. The original film was the first to have a score comprised entirely of brand-new songs by the Golden-Era master, Irving Berlin, and proved a phenomenal success, breaking box office records and inspiring new dance trends while cementing the burgeoning popularity of its songwriter and stars. Already a soaring success in its own right, the stage production is the first Irving Berlin movie to be adapted for live performance, packing out theatres and kindling a love of the songs and story in a new generation. Returning to the Birmingham Hippodrome after its previous run in 2011, the show has been hotly anticipated by attendees, with many avid attendees booking their tickets many months in advance. And if last night’s smiling faces and thunderous applause are anything to judge by, it seems that it more than lived up to expectations. 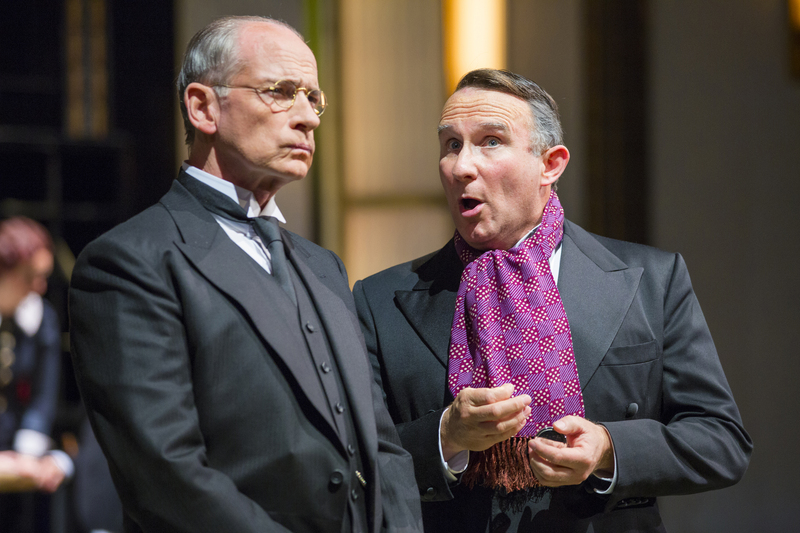 The performances were top notch, with Alan Burkitt deftly capturing Jerry Travers’s cheeky charm, while John Conroy as the Hardwicks’ in cognito butler, Bates, and Sebastien Torkia as ambitious Italian fashion designer, Beddini, left the audience giggling like children. 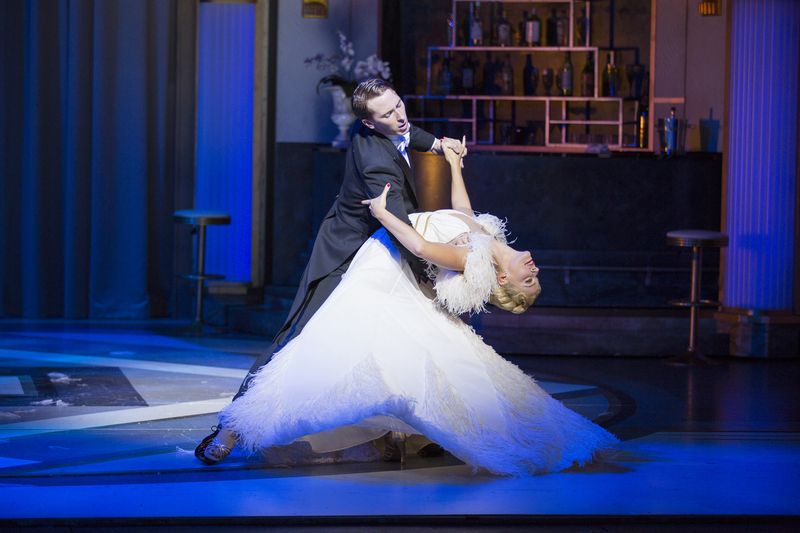 Despite a few vocal slips, Charlotte Gooch made a charismatic and beautiful Dale Tremont, expertly and energetically pulling off some very difficult dance moves. Dancing and choreography were faultless all round, and both Burkitt and Torkia delivered Berlin’s iconic tunes with pitch-perfect gusto They were helped along by an excellent orchestra (led by Jae Alexander) who alone would have made this show worth attending. It wasn’t just the viewers looking fabulous, either – there were some truly stunning costumes on stage. My personal favourite was a radial pleated gown in shimmering gold that made its wearer shine like a sunbeam, followed a close second by Madge’s saucy, red satin number, complete with a low, draped back and offset by a dazzling white crystal choker. Even more striking than these, however, was the lavish yet versatile set which allowed for fluid shifts in location from New York to London to Venice. The portrayal of Jerry tap-dancing with a hatstand in the hotel room above Dale’s was particularly well-designed, using a clever trick to allow us to see both rooms side-by-side at once. The performance closed with an unquestionably deserved standing ovation and extra renditions of songs that will no doubt be stuck in viewers’ heads for weeks. Definitely a show worth every dime. Following numerous sell-out runs in Britain and beyond, smash-hit musical Dirty Dancing will return to the Birmingham Hippodrome this year as part of its 2015 UK tour. Based on the film by Eleanor Bergstein, the stage adaptation has already broken numerous records, becoming the fastest selling show in West End history when it opened in 2006, and going on to take an unprecedented £42,000,000 from its first tour of the country in 2011. 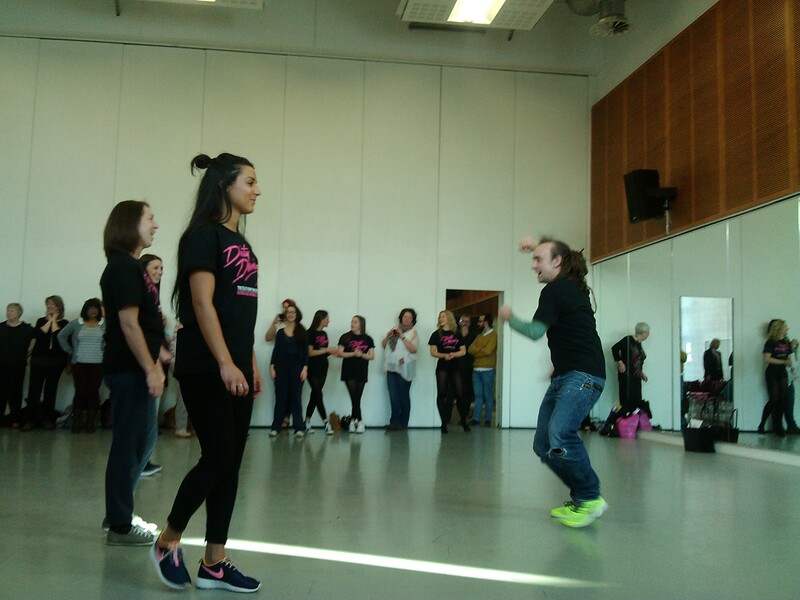 Ramping up the already palpable buzz for its hotly anticipated spring visit to Birmingham, a special Dirty Dancing workshop took place at the theatre on Thursday, with fans invited to relive the show’s powerful energy through lesson’s with choreographer Glenn Wilkinson and dancers Lisa Welham and Albey Brookes. A brief introduction from producer Karl Sydow kicked off the afternoon, explaining how the stage show had come to be and emphasising the huge popularity of both the musical and its movie counterpart. A video clip showed thrilled theatre-goers, including members of the public and celebrity fans, gushing about their experiences, and their excitement was mirrored in the enthusiasm with which attendees took to the dance floor as we were led into the next room. I’m definitely no dancer – three moves was about as much as I could manage – but it was still fun watching from the sidelines, especially since my fellow First Night Blogger, Becky, made a much better job of it than I did! 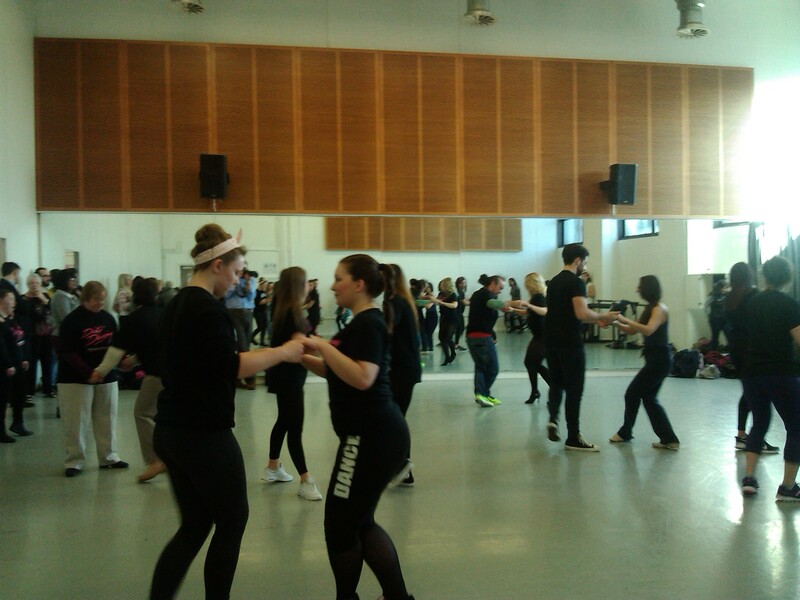 The three dancers led the workshop with participants split into two groups, and one lucky lady even had the chance to dance with one of the professionals. Her partner, Albey Brookes, will join the Dirty Dancing ensemble cast when the show arrives in Birmingham in April. 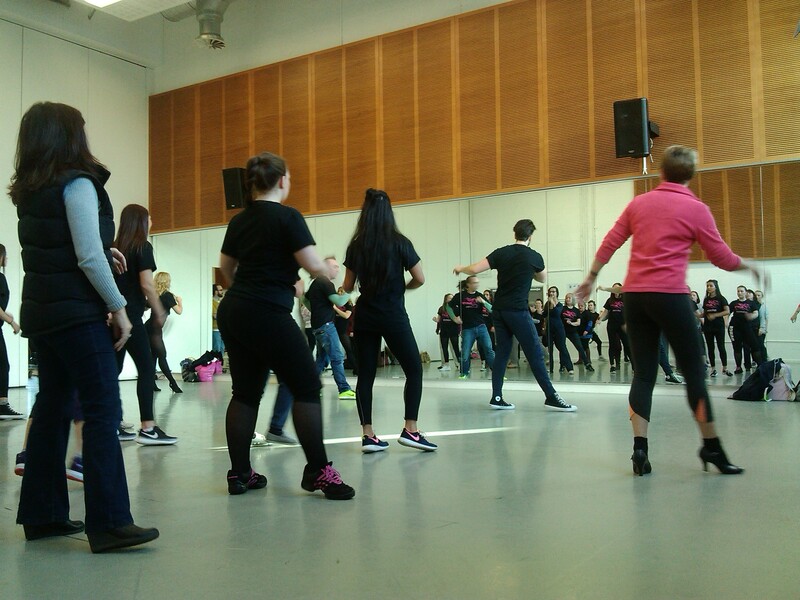 Afterwards, we had chance to talk with choreographer about how he ended up working on the show. While his own background is in contemporary dance, his introduction to the world of musicals came through his wife, who also works in the business. 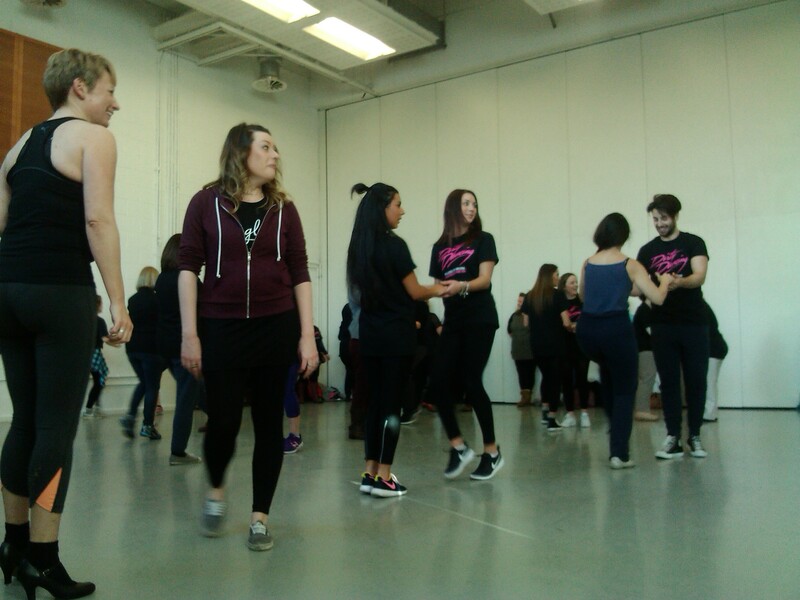 With several years experience of working on Dirty Dancing and other shows now behind him, however, he’s had plenty of time to get used to creating big, showstopping numbers. His contemporary training has even come in handy for Dirty Dancing, allowing him to add his own twists and flourishes to its rock-and-roll style, resulting in a truly unique production. 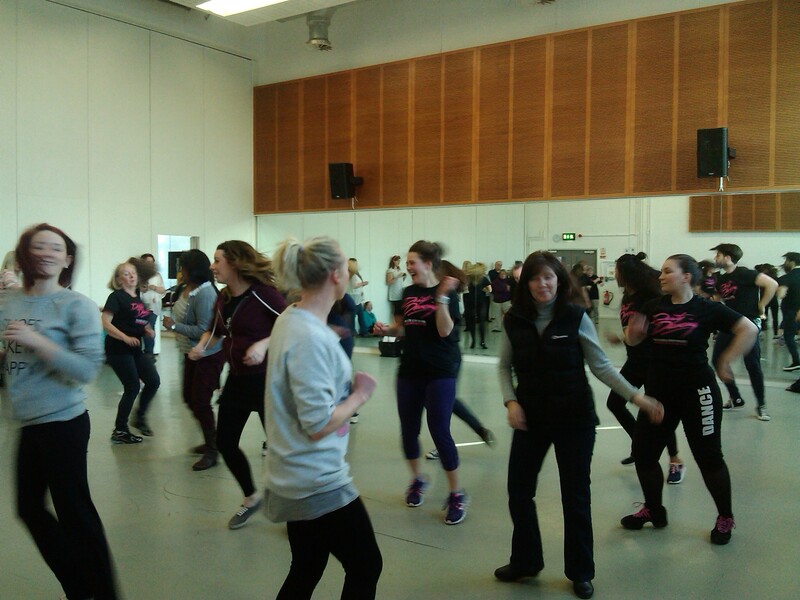 Dirty Dancing opens at the Birmingham Hippodrome on Thursday 30th April and runs until Saturday 23rd May. To book tickets, call 0844 338 5000 or visit the theatre’s website. 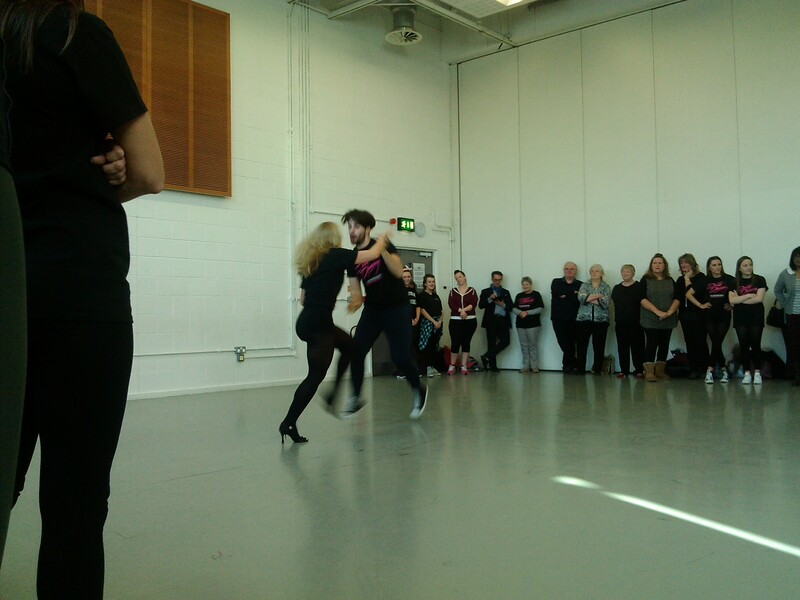 Full UK tour dates can be viewed on the Dirty Dancing UK Tour site. If you plan on going along, don’t forget to share your experience via Twitter using the hashtags #DDTour2015 and #BHdirtydancing. On a stormy winter night in 1928, a young c ouple on their way to a party find their car stuck in the thick snow surrounding their destination. Unable to press on, they take refuge in an abandoned lodge, where they’re soon joined by two fellow party-goers who have also been having trouble with the weather. Determined to keep their spirits up and make the most of their “chance” encounter, the members of the little gathering share drinks, show off their fancy dress costumes and, in the spirit of Christmas, begin telling ghost stories. It all seems like harmless fun, but in that cold, dark and intimate space, tension builds, with desire, jealousy and fear bubbling just beneath the surface. So far, so straightforward: with its period setting and sexually charged undercurrent, The Frozen Scream starts out feeling like a classic Sarah Waters story. But don’t get too comfortable: as the characters gradually lose their grip on reality, struggling to distinguish fact from fiction, you might find yourself starting to get lost in their nightmare, too…. 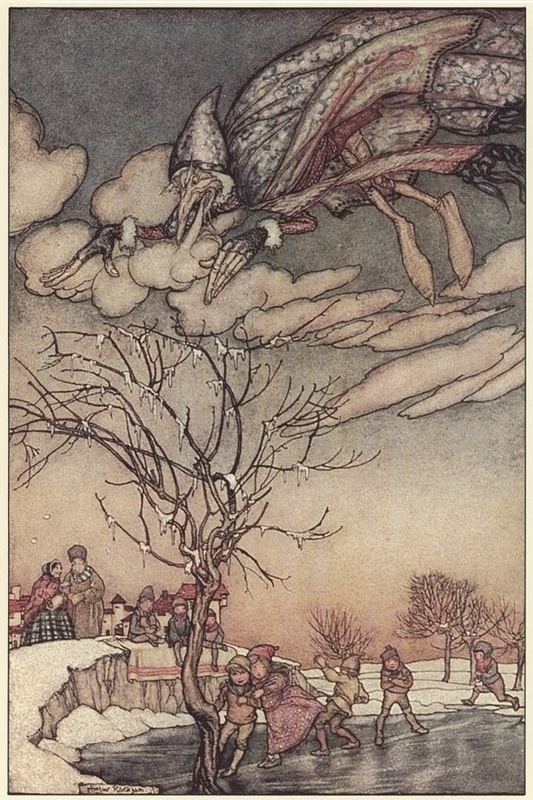 Created by Sarah Waters and Christopher Green, The Frozen Scream is a festive ghost story with a difference. Inspired by CC Gilbert’s 1928 novel of the same name, the show playfully merges the layers of history within the tale with the history of the novel itself. Partly inspired by Norse mythology and folk traditions, the story deals with the figure of Jack Frost, contrasting cuddlier, modern takes on the character with the more menacing shape he originally assumed. At the time of publication, it caused something of a stir, but today, The Frozen Scream has been all but forgotten after widespread belief in a curse surrounding the novel frightened potential readers and drove it from popularity. Whether or not you’re inclined to be superstitious, Green’s and Waters’s take on the tale is certain to leave you on edge, masterfully building and undercutting suspense throughout. Nervousness grows, only to be deflated, leaving viewers in a constant state of uncertainty, distrusting everyone even as they doubt their own fears. The cast is wonderful, in equal parts spooky and hilarious, and the visuals are fantastic, including a gorgeous set, sparkly costumes and some brilliant special effects. A little more use of sound beyond knocks and scratches might have been made to heighten the drama further: this feels like a production that will only get more polished and compelling through more performances, so here’s hoping it will eventually tour elsewhere beyond the Wales Millennium Centre and the Birmingham Hippodrome. As it stands, though, it’s a hugely entertaining, thoroughly unique and very affordable night out that comes highly recommended to anyone brave enough to give it a try. The Frozen Scream continues its run at the Birmingham Hippodrome until Saturday 17th January, and comes with 16+ age guidance. Tickets can be booked via the theatre’s website. Another year, another hilarious Hippodrome panto – it’s hard to believe that Snow White and the Seven Dwarfs was so long ago, but here we are again. This Christmas, Jack and the Beanstalk sees its murderous giant brought to life in stunning 3D by Whizzbang 3D Productions before a squealing audience. On press night at least, there were also a few squeals of a rather different sort directed at the show’s leading man, Blue’s Duncan James. Assisting the wicked giant is the slimy, treacherous Fleshcreep, played by Coronation Street‘s Chris Gascoyne, looking excellent in a sweeping black coat, top hat, shades and thick eyeliner. Meanwhile, helping out our hero on the good team are Jane McDonald’s glamorous Enchantress and returning comedy trio Gary Wilmot, Paul Zerdin and Matt Slack, as Jack’s mum, Dame Trot, and his two bonkers brothers, Simple Simon and Silly Billy. As ever, the show is an absolute visual feast – and not just because it features enough beans to feed a family for weeks and a comedy routine centred on the names of different chocolate bars. Stunning sets, beautiful backdrops and gorgeous, glittering lights are all in abundance, while the fabulous array of costumes includes the Enchantress’s dazzling dress, Fleshcreep’s gothic get-up and a whole host of fluffy farm animals who gallop, trot and pad across the stage for a charming dance sequence with the Dame. As well as the giant, the special effects also encompass a beanstalk so tall it looks as though it might topple (don’t worry – no audience members were harmed in the staging of this performance, as far as we know), and an amazing helicopter and animatronic giant that operate with a similar mechanism to last year’s Black Country dragon. Throughout the show, there’s a brilliant chemistry between Jane McDonald’s and Chris Gascoyne’s constantly clashing helper characters, and Wilmot, Zerdin and Slack are back on form, bouncing off each other and providing the driving energy behind this production. There are some great set pieces in Act I, including the aforementioned chocolate bars skit, some well-timed slapstick from Silly Billy, and a couple of nice moments with Simple Simon and his cheeky puppet, Sam. However, it’s in the second half that the comedy really picks up, with a hysterical 12 Days of Christmas routine which last night saw one viewer almost knocked out by flying loo rolls. Up in the giant’s castle, Dame Trot and her boys keep up their spirits with a rendition of “All About That Bass”, and the end of the show features some audience participation when Paul Zerdin invites some of the little ones up onto the stage for a sing-song – and, of course, some human ventriloquism. But the gags aren’t the only thing guaranteed to have you leaving the theatre with a smile on your face: brilliantly choreographed, the big dance numbers to the classic “Ain’t No Mountain High Enough” and Pharrell’s irresistible “Happy” will have you grinning and humming along whether or not you mean to. 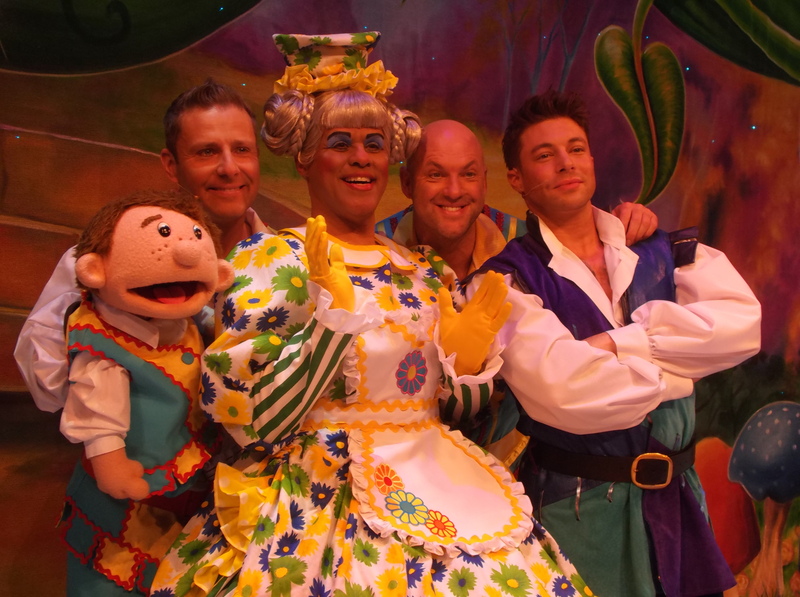 Once again, Michael Harrison and Qdos bring you panto at its finest. Oh yes they do. Jack and the Beanstalk is showing at the Birmingham Hippodrome until Sunday 1st February, with a special relaxed performance on Thursday 29th January. For more information and to book tickets, visit the Hippodrome website, and don’t forget to watch out for a Radio 2 broadcast about Britain’s biggest pantomime on Christmas Day. The opening night of the Birmingham Hippodrome panto draws near, and the stars are now kitted out with all their colourful costumes. With just one more sleep to go, Jack and the Beanstalk is looking amazing, a truly dazzling set having taken over the theatre’s main stage. Earlier in the rehearsal process, I had chance to speak to actor and comedian Matt Slack, who is returning to the Hippodrome after taking up the role of Oddjob in Snow White and the Seven Dwarfs last year. This year, he’ll playing Jack’s daft brother, Silly Billy, alongside his returning co-stars, Paul Zerdin (Simple Simon) and Gary Wilmot (Dame Trot). 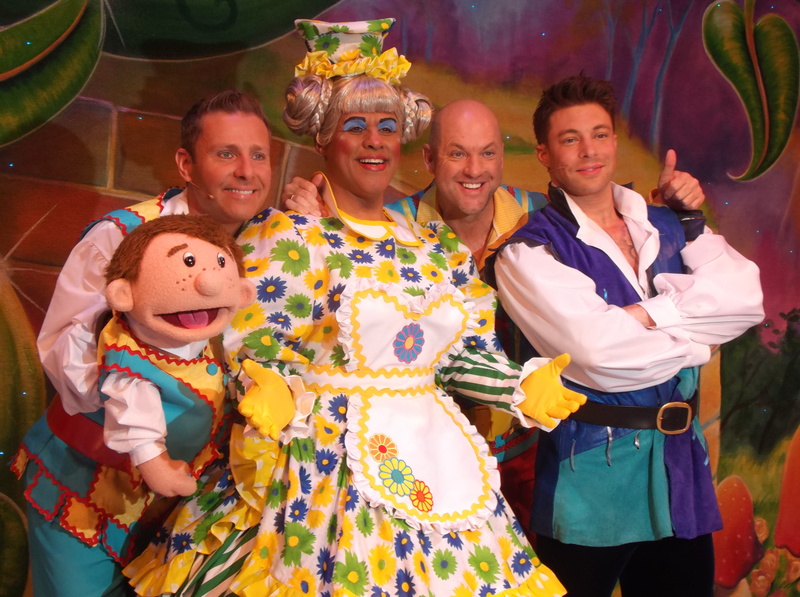 You’re returning to the Birmingham Hippodrome pantomime for the second year running. How is this year’s panto comparing to 2013’s? I’m really thrilled to be back. It’s going to be difficult to follow last year’s because it was such a huge success. The response from the Birmingham audience was just incredible! It is the best in the country, and I’ve done a lot of these now. We set the bar really high so we’ve got a lot to live up to, but already in the rehearsals there’s a fantastic vibe and we can tell it’s going to be funny and spectacular! It’s great to be back with Paul and Gary. Duncan James [Jack] and Jane McDonald [The Enchantress] are both brilliant to work with too. Jane’s never done it before but she’s a natural. Normally it feels a bit daunting at the start, but in this case, I don’t have a bad word to say about anything. I’m going to be doing some new material – obviously you don’t want to repeat anything. But hopefully it will be all the same quality as last year. Has it been fun reuniting with your co-stars from Snow White and the Seven Dwarfs? Yeah! Me and Paul are good mates anyway. I think it makes it more exciting to have all three of us together again, and it’s helped the rehearsals to move along a bit more quickly because we’ve already broken the ice and we know each other – there’s none of that “first day at school” kind of awkwardness. Tell me about your character. Is it quite similar to last year’s? Have you had chance to have a look at your full costume yet? I’ve just tried it on. It’s brilliant! Something happens when you put the costume on – it just instantly puts you into “panto mode”. It’s almost the same as my costume last year except for the colours, which is good because it means I’m already comfortable working in it. 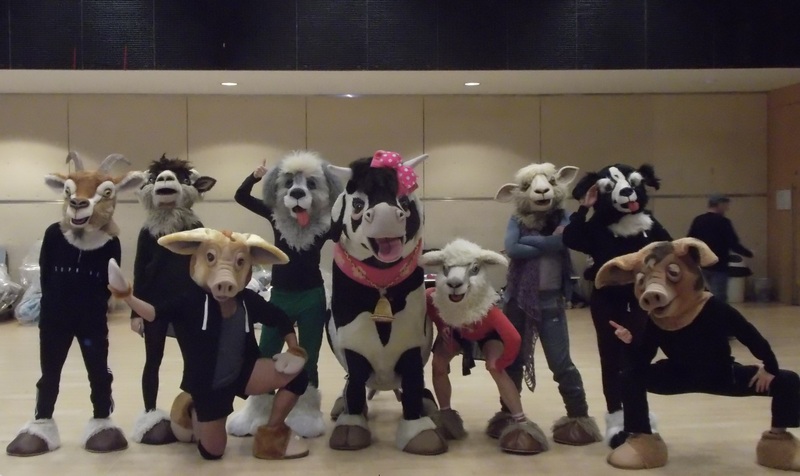 All of the costumes are specially made, this being the biggest panto in the country. It’s quite im portant that they’re comfortable because the performances can be very physical, and because of the number of shows we do. Have the rehearsals got you feeling festive and ready for Christmas? Well, this panto starts so late that it will be very close to Christmas when we start performing. It doesn’t actually open till the 19th December. It can sometimes be hard to be in the Christmas spirit when you’re working so hard, but ultimately panto is Christmas for me, so yes, I am starting to feel festive. 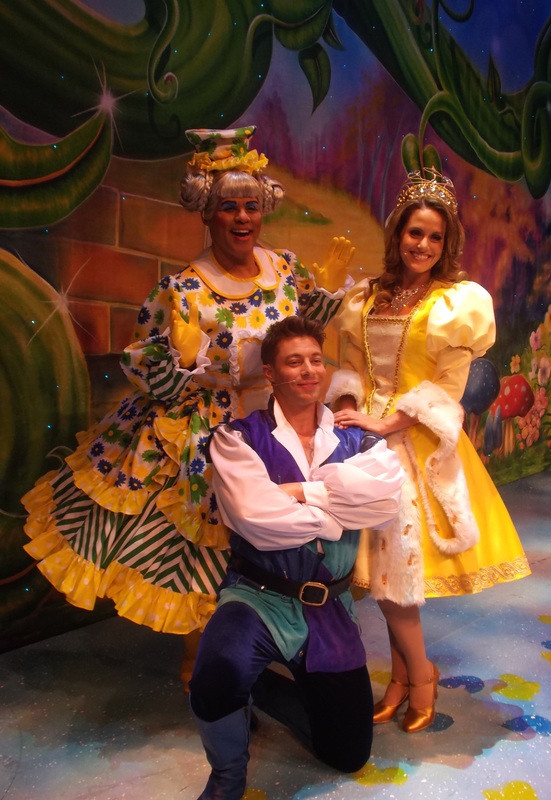 Jack and the Beanstalk opens at the Birmingham Hippodrome tomorrow evening. To find out more and to book tickets, visit the Birmingham Hippodrome website. Est. 2012 - "High brow. Low brow. Mono-brow." Where regrets are manufactured before your very eyes.